GCell Dye Sensitized Solar Cells (DSSC) are a smart choice for energy harvesting when integrating a solar module into an electrical device. 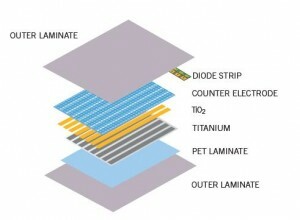 Dye Sensitized Solar CellsÂ (DSSC) are widely regarded as the most promising third generation photovoltaic (solar) technology. These cells are the closest mankind has come to replicating natureâ€™s photosynthesis. Paying homage to its inventor Professor Michael GrÃ¤etzel we call it GCell. GCell Dye Sensitized Solar CellsÂ (DSSC) areÂ a smart choice for energy harvesting when integrating a solar module into an electrical device using a rechargeable battery or super capacitor. GCell Dye Sensitized Solar CellsÂ (DSSC)Â are suitable for a broad range of electronic application and offers many benefits over other solar technologies. GCell Dye Sensitized Solar CellsÂ (DSSC) areÂ designed using the most advanced photo-reactive nano-engineered materials using an inexpensive, energy-efficient manufacturing process. Flexible – Tested to withstand flexing over 10,000 times around a 25mm radius with no measurable drop in performance. Robust – Tough enough to withstand impact, drop tests and compression making it suitable for everyday usage without fear of breakages. Thin – Adds minimal thickness to any product application; approximately the thickness of a credit card. Lightweight – Easier to transport, lower logistical costs and adds minimal weight to any product application. Versatile – Easily integrated into a wide variety of product applications. Durable – Excellent vapour barrier properties using high-performance polymer front sheet barrier film with high light transmission coupled with a base aluminium PET foil. To learn more about GCell and the custom cell configurations available visit Custom Solar Cells.